The term claudication refers to inability to walk distances because of pain or tiredness in the buttocks and legs. There are two types of claudication: neurogenic and vascular. Neurogenic claudication occurs because of narrowing in the spinal canal (stenosis) causing pressure on the spinal nerves. Vascular claudication results from blood flow that cannot match increased demand of muscles in oxygen during walking. Spinal nerves run inside a canal formed by vertebrae (spine bones) and discs from the front and by a thin layer of bones connected with ligaments on the back side. With age, arthritic changes may cause narrowing of the disc, formation of bone spurs and thickening of the ligaments. As the discs become narrower, the ligaments lose their tension, buckle and start pushing into the spinal canal producing pressure on the nerves. Why do I have symptoms when I stand and walk but not when I am sitting? Many people report that they have no pain while sitting and are able to walk much farther if they use a shopping cart. The reason for this may be explained by anatomy. Ligaments are attached on the back surface of the spine. When we stand up, the back extends bringing the attachment points for the ligaments closer together. This causes wrinkling and buckling of the ligaments and narrowing of the spinal canal. When you sit down, the back is bent forward tightening and straightening the ligaments thus removing pressure from the nerves and relieving the symptoms. The same effect occurs when you lean on the shopping cart in a store. Is neurogenic claudication the same as sciatica? Even though both conditions are caused by pressure on the nerves, the difference is in the way people describe their condition, thus creating difficulties in diagnosis. With neurogenic claudication a person experiences dull pain, pressure or extreme tiredness mostly in the buttocks and back side of both legs. It is caused by pressure on all of the nerves within the spinal canal. Neurogenic claudication occurs more commonly in people older than fifty and is caused by spine arthritis. 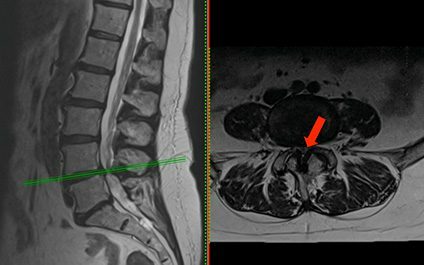 Younger patients more often have to deal with sciatica, also called radicular pain, caused by a disk herniation. With sciatica, there is either pressure or irritation of a single nerve causing pain usually in one leg. Claudication symptoms increase with standing or walking and resolve with sitting unlike sciatica that may increase with sitting. What other conditions may cause symptoms similar to claudication? As previously discussed, poor blood flow may have a similar presentation. This condition is called vascular claudication. When you walk, leg muscles require increased amounts of oxygen. If narrow vessels cannot supply adequate blood flow to the muscles, then the muscles start cramping causing you to stop. Arthritis in the hips or knees is another very common cause of inability to walk distances. Sometimes these conditions coexist in the same person. Physical examination and additional studies typically help determine the leading cause. 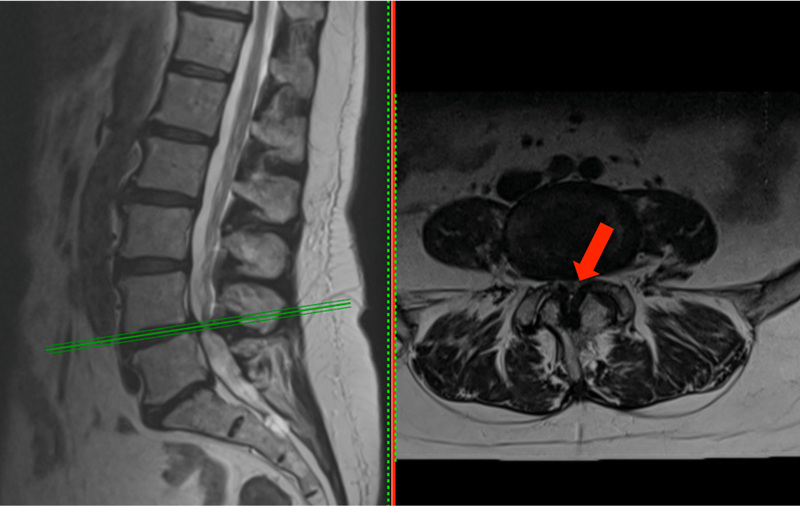 While the symptoms may suggest compression of the spinal nerves, the ultimate diagnosis is made based on additional imaging, most often MRI (Magnetic Resonance Imaging) or CT (Computed Tomography) of the lower back. X-rays may help identify any spine instability that may be the underlying reason for stenosis. If poor blood flow is suspected to play a role, a vascular study, arterial Doppler ultrasound, may be needed. There is a favorable balance between the benefits and risks of having a surgery. Will it progress? Am I going to be paralyzed? Patients often ask, “Am I going to be paralyzed if I don’t have surgery?” The answer is most commonly “no”. While patients with severe pressure on nerves may notice weakness in certain muscles, it is impossible to predict who will develop weakness. Prophylactic surgery, however, is not recommended, since we cannot predict who is at risk of developing weakness. If prophylactic operations were performed, we would see an increase in surgery and resulting complications. The main problem in neurogenic claudication is pressure on the nerves. Hence, decompression, i.e. removing pressure from the nerves, is the main goal of surgery. If there is excessive movement between the bones, a stabilization procedure (fusion) may be required. This can be accomplished either with direct or indirect approach. In direct approach your surgeon looks at the nerves directly and removes any tissues pushing on the nerves. Examples include laminectomy and TLIF (Transforaminal Lumbar Interbody Fusion). 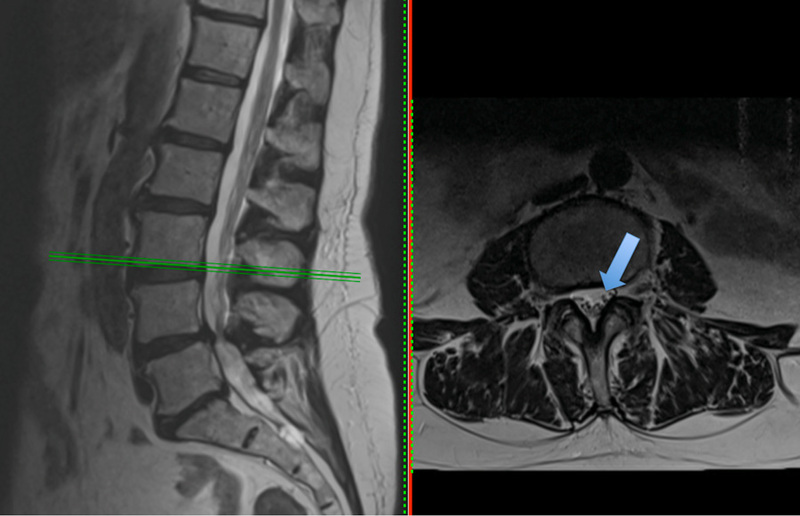 With indirect approach, restoring the height of the collapsed disc thus putting pressure on the surrounding soft tissues alleviates pressure on the nerves. This is accomplished by placing a spacer between the vertebral bones. Examples include ALIF (Anterior Lumbar Interbody Fusion) and LLIF (Lateral Lumbar Interbody Fusion).